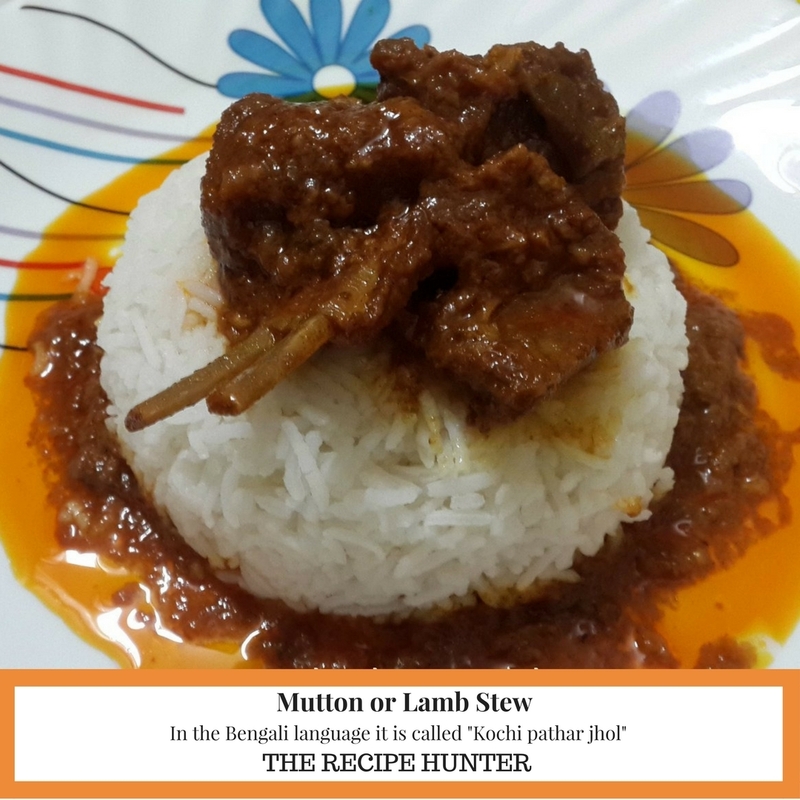 It’s always a meaty Sunday in every Bengali household in India. It could be either mutton curry or chicken curry, Sunday lunch cannot go without meat. There have to be potatoes in this curry. The key ingredients to this jhol are onion, garlic, curd and benali garam masala which is a combination of green cardamom, cinnamon, and cloves. Traditionally it was grounded on a stone grinder and was dropped on the freshly cooked stew along with a dollop of desi ghee or clarified butter. Now life is easier with mixer grinder and also cooking is done with minimum fats so no Ghee. This stew does not need frying masalas separately. Mutton is marinated with everything except tomato and cooked on a slow fire in the same vessel. Traditionally tomato was never used in Bengali cooking. Tomato was not grown India. That’s the reason, in many traditional Indian and Mughlai cooking also, tomatoes are not used. This fruit came to India by way of Portuguese explorer during the early 16th century. However, these plants took well in Indian soil. Gradually Tomatoes have become key ingredient are used extensively in most of the dishes. Water qtr ltr or as per your choice of consistency of gravy. Wash the mutton pieces thoroughly and keep in a colander so that extra water is drained. Take a deep bowl. Put mutton in it. Add onion, garlic, ginger, coriander powder, cumin powder, turmeric powder, kashmiri mirch powder, javity and jaifal powder (optional), curd, salt, sugar(optional) and pour the oil. Now use your fingers to mix it all with mutton. The mutton should be well coated with all other ingredients. Marinate it at least for 2 hrs. Preferably overnight. Take heavy bottomed wok. Transfer the marinated mutton in heat. Put on the gas and let it cook. A lot of liquid will come out from the meat and the curd. Reduce the flame to low and let the meat cook in its own juices. Give a nice stir after 2-3 mins. Keep an eye on the liquid. It will get reduced slowly. Once it reduces it should be sired frequently. It may take 15-20 mins to dry up the liquid. The oil will be separated. Now its time to add pureed tomato. Keep stirring till the tomatoes are mixed and the oil separates. At this time nicely fry the meat till the masala starts sticking to the base. This stage the bhunoing stage. This is done so that the raw masala and oil gets a good fry. Add potatoes and pour water. Now scrape out the masalas which have stick to the base. Give a nice stir. Check the salt level. Add if required but mind it the liquid will be reduced more while meat gets cooked. Let the liquid starts boiling. Reduce the flame to minimum. Put the lead and cook until the meat is tender. It may take another 15 mins. For quick cooking after adding water. It could be transferred to a pressure cooker and cook on medium flame till 3-4 whistles. When the meat is cooking prepare the garam masala. Make a paste of cardamom, cinnamon, and cloves. If you have a powder of these ingredients, make a thick paste combining all. Add this paste along with a spoonful of ghee when the meat is cooked. Stir and cover it so that the aroma of the garam masala remains intact. Best paired with steaming hot basmati rice. Or bread loaf, roti or Naan. Wow this looks melt in mouth. I love stews as you know!